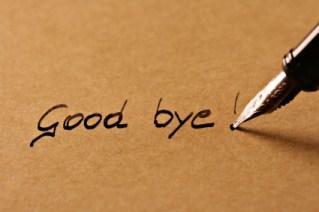 Say goodbye with a farewell party. Figuring out how to plan a farewell party is relatively simple. Whether you are moving from one side of town to another or one side of the country to another, a farewell party is an excellent way to say goodbye to those you love. Going away parties offer people who are moving a chance to see their friends, family and coworkers one last time before they leave. When you are planning a farewell party for someone else, the first thing to do is decide whether it should be a surprise party. If you think the honored guest will enjoy a surprise party, make sure you make the secret clear on the invitations. Host the party at your home, church basement, community hall or other large location. Consider having a potluck party or having simple buffet party foods available for everyone to enjoy, along with some punch, sodas and other drinks. Once everyone has arrived at the party, give a toast to the person, couple or family who is moving away. Mention the positive impact they have had on everyone in attendance and how much they will be missed by everyone. Finally, consider having a small journal or scrapbook available for people to write their final farewell messages. Add some snapshots from the party and give the book to whomever is moving away before they depart. Send party invitations to everyone so that no one will feel slighted or forgotten. Use your Facebook, Twitter or other social media contact list as a starting point. Consider hosting the party in a location like a bowling alley, restaurant buffet or bar and grill backroom if your home is being packed up. This means less work for you. Make sure you have plenty of food and drinks available, usually from the venue where the party is hosted. Give a speech to everyone about how much you will miss them and how much it means to you that they all came out to see you off. Date: The party date is almost as important as any other aspect. After all, the party should be hosted as close to the date of departure as possible, but not so close it can create a problem for the person/people who are leaving. A good time to host the party would be the weekend before leaving. Decorations: A "good luck," "we'll miss you" or "goodbye" banner is commonly hung at the entrance or near the food at the party. Choose tablecloths and napkins in the same color scheme as the banner. Twist some crepe paper around doorways and windows. Decorations do not have to be complicated to be festive at a farewell party. Favors: Skip traditional party favors at a farewell party. Instead, have small business cards or magnets printed that have the person or family's new address and phone number listed, along with an email address. This way, everyone can stay in touch even after all the farewells have been said. Planning a farewell party is a wonderful gesture for a cherished friend or relative who is leaving the area, and it's a great way to thank people who support you when you leave. No matter where you move, the memories made at a farewell party are ones sure to stay in the forefront of your mind as you continue on in your life's journey.